The new campaign by former Israeli Ambassador to the U.N. Ron Prosor tackles the absurdity of the Palestinian refugee narrative by displaying the successful lives of nine descendants of Arabs who left Israel in 1948 but who still identify as refugees. Later, when interviewed for various studies, the children admitted that if it hadn’t been for the UNRWA education, they might have lost their identity and assimilated into the society that surrounded them. Now the Abba Eban Institute for International Diplomacy at the Interdisciplinary Center Herzliya is “exposing” the decidedly non-refugee lives of many of these children who grew up, established careers, acquired professions, and sometimes became wealthy. The campaign, titled “Double Identity,” is the brainchild of institute director and former Israeli Ambassador to the U.N. Ron Prosor and his team. It focuses on individuals from the second, third, and fourth generation of the never-ending Palestinian refugeedom. The exhibit represents a new dimension of the public diplomacy campaign Israel is waging against the U.N. The institute wants to see UNRWA shut down by being merged with the Office of the U.N. High Commissioner on Refugees (the U.N.’s agency for all other refugees worldwide), under a clear mandate to eradicate Palestinian refugeedom rather than preserve it for all eternity, as has been done thus far. The unique refugee mechanism the U.N. created for the Palestinians has created 5.3 million refugees over the course of seven decades, even though only some 700,000 Arabs left Israel in 1948, most of whom are no longer alive. Research generally repeated the narrative of Palestinian refugeedom, which passes from generation to generation, with children, grandchildren, great-grandchildren, and great-great-grandchildren now unwilling to give up their “right of return.” Now Prosor and his staff are launching a different campaign for public opinion in the U.S., one that includes pictures and stages of the lives of nine people that illustrate the absurdity of Palestinian refugeehood. All the material in the exhibit was collected from open sources, generally texts that the nine people featured wrote or published on social media or various Internet sites. Three people represent the youngest generation of “refugees” in the Double Identity campaign: Tareq Abu Nahel, Hoda Daoud, and Batoul Bilali, all in their 20s. Their life stories are distinguished by a lack of distinction. They aren’t different from other people their age who are living comfortably in the West, and Prosor and his team chose them to model the face of twenty-something Palestinian refugeedom precisely because it isn’t clear what aspects of their lives earn them refugee status. Abu Nahel was born in the Gaza Strip and now lives in Oslo, Norway, with his family. Daoud and Bilali were born and live in Lebanon. Abu Nahel launched a successful career as a young rapper, and some of his songs are about the Palestinian struggle. Daoud, whose father moved from Gaza to Lebanon when he was 17, holds a degree in mathematics and economics from the American University of Beirut. She recently posted pictures of a successful adventure holiday she took to Morocco. Bilali, who earned a B.A. in business administration, frequents the theater, art galleries, and her hobbies include swimming, kayaking, and hiking. Her father, Nabil Bilali, owns Original Dental, a thriving dental equipment supplier. Bilali dreams of running a research center devoted to promoting a healthy lifestyle. Iyad el-Baghdadi, 41, a native of Kuwait, is a third-generation refugee and a noted author and human rights activist who now lives with his family in Norway. His grandparents were uprooted from Jaffa in 1948 and went to Egypt, along with Iyad’s father, Ismail, who was only a baby. Two decades later, the family moved to the United Arab Emirates. Al-Baghdadi gained fame during the Arab Spring of 2011 when he penned a satirical essay titled “The Arab Tyrant’s Manual” that mocked and needled the Arab dictators whose regimes were being shaken up. The essay was translated into 13 languages. In the spring of 2014, el-Baghdadi was arrested for his activity and writing, not given a trial, and deported from the UAE. After a brief stay in Malaysia, he was given asylum in Norway, where he is now working on a book about the Arab Spring. In his writing and lectures, he represents himself as a “citizenshipless Palestinian refugee from the Arab Emirates.” According to the UNRWA definition, el-Baghdadi and his children, who belong to the third and fourth generation of Palestinian refugeedom, are counted as refugees and entitled to aid from the organization. Mona Hatoum, 67, was born in Lebanon and now holds British citizenship. She is the daughter of parents who left Haifa in 1948 and became refugees in Lebanon. Hatoum’s father worked in the British Embassy in Lebanon, making him and his family eligible for British citizenship. In 1975, while the family was visiting London, the Lebanese civil war broke out and they were forced to stay in Britain, eventually making it their home. Hatoum studied at the Byam Shaw School of Art and the Slade School of Art and eventually won accolades for her video work, performances, and installation. In 1995 she was nominated for the prestigious Turner Prize. She now has work on display in prominent museums across the globe and is represented by famous galleries, including White Cube in London. Her work has also been exhibited in Israel, and a few pieces are in the Israel Museum. Two other women who had stellar careers while defined as refugees by UNRWA are actress Shukran Murtaja and media personality Mayssoun Azzam. Murtaja, 48, is a native of Saudi Arabia and the daughter of parents from Gaza who moved to Syria, where she was educated and became famous as an actor in films and TV series. Murtaja graduated from the Higher Institute of Dramatic Arts in Damascus, and after she married a Syrian actor she was given Syrian citizenship and lived a comfortable life there. Eight years ago, Murtaja visited the Gaza Strip and met with her father’s family and said she identified with the suffering of the residents of Gaza. Azzam, 45, is a native of Abu Dhabi. Her parents fled Israel for Lebanon in 1948. Azzam is a television broadcaster in Dubai who has worked for the Al-Arabiya news network since 2003. She teaches media studies at the American University in Dubai. Over the course of her career, she has interviewed PA President Mahmoud Abbas; Microsoft founder Bill Gates; former British Prime Minister Tony Blair; and former Palestinian Authority Prime Minister Salam Fayyad. In 2011 she took part in an ad campaign for a coffee company. She learned to ride horses and completed a B.A. in communication at the Lebanese American University and an M.A. in international politics at Birkbeck, University of London. The last two people featured in the Double Identity exhibit are Fatma Dabdus and Abdul Rahman Katanani. Dabdus, born in the U.S., was five when her family moved to Lebanon. Today she teaches at the school of medicine at the American University of Beirut and says she enjoys swimming, reading, politics, and history. Dabdus, like many others with similar life stories, claims Palestinian refugee status despite the fact that she was born in the U.S., raised in Lebanon, and her life is in no way reminiscent of the image of a helpless refugee who needs international aid. Katanani is a successful artist. His grandparents left Yazur (now Azur), a tiny village near Jaffa, 71 years ago and moved to Lebanon. Although he grew up in the Sabra refugee camp in Beirut, he no longer lives the life of a refugee. He earned a B.F.A. and an M.F.A. from the Lebanese University in Beirut, apprenticed in France, and has won many important prizes for his work. His pieces, which often reflect identification with Palestinian suffering and the Palestinian struggle are on display all over the Arab world, as well as in galleries in Munich and Paris. They fetch hefty prices. Prosor underscores that Double Identity aims to move the debate over UNRWA from the macro to the micro and show who the Palestinians – who represent themselves or are portrayed by others as refugees deserving of UNRWA assistance –really are. “If the grandfathers and grandmothers of these people and people like them were refugees from anywhere else in the world, they would already have settled permanently and not be entitled to transfer refugee status to their children,” Prosor says. The Abba Eban Institute has discovered that UNRWA spends an average of $250 per year on each of the 5.3 million Palestinian refugees, compared to the average $60 dollars the U.N. Refugee Agency on each of the 68 million other refugees worldwide. UNRWA’s employment rolls also point to bloat. Some 10,000 people work for the U.N. Refugee Agency, while UNRWA – which handles a number equivalent to 8% of the number of refugees in the charge of the U.N. Refugee Agency – employs three times as many, some 30,000. 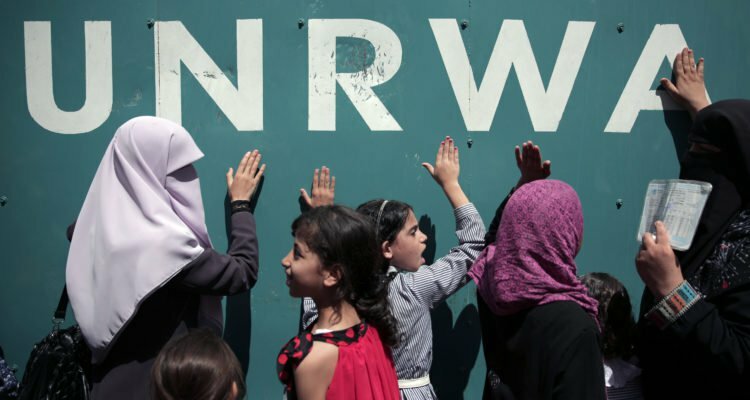 “The U.N. won’t merge UNRWA and the U.N. Refugee Agency without heavy pressure on it to do so. The Double Identity campaign and other public diplomacy on the issue of UNRWA and the refugees … will help coalesce public opinion in support of the pressure the U.S. and Israel are putting on the U.N. The goal is to end this [UNRWA] scandal, which even now maintains refugee camps that have turned into breeding grounds for hatred and terrorism against Israel,” Prosor says.